This interesting surname of English origin is either a locational name from Cornwall in Oxfordshire so called from the Old English pre 7th Century "corn" a metathesized form of "cron", "cran" meaning "crane" plus "well(a)" spring, stream, or it is a regional name from the county of Cornwall, so called from the Old English pre 7th Century tribal name Cornwealas. This is from Kernow, the native name that the Cornish used to denote themselves, of uncertain etymology, perhaps connected with a Celtic element meaning "horn", "headland", compounded with the Old English pre 7th Century "wealas" meaning "strangers", "foreigners". The surname dates back to the mid 12th Century, (see below). 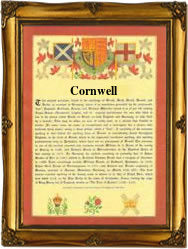 Variations in the idiom of the spelling include Cornewell, Cornewall, Cornwal, etc.. One, Marye, son of Clementt Cornwell, was christened on December 7th 1545, at St. Olave Old Jewry, London, and Jone Cornwell married Edward Hearne on July 9th 1565, at St. Margaret Lothbury, London. A coat of arms granted to this family is a silver shield with a red lion rampant ducally crowned gold, within a black bordure bezantee, the crest being a red demilion rampant ducally crowned gold. The first recorded spelling of the family name is shown to be that of Roger de Cornwelle, which was dated 1161, Eynsham, during the reign of King Henry 11, known as "The Builder of Churches", 1154 - 1189. Surnames became necessary when governments introduced personal taxation. In England this was known as Poll Tax. Throughout the centuries, surnames in every country have continued to "develop" often leading to astonishing variants of the original spelling.